How many lines of code does a developer need to check if a syntactically valid email address was entered? As you can see, in many of today's most popular programming and scripting languages, a programmer who knows what he or she is doing needs only one line of code. Sure, the regex pattern used to make this work is not a prime example of easy-to-read code. But compare this to two dozen lines to do the same tests in procedural code. A single regular expression takes far less time to test and debug, and is probably easier to read by the developer who has to maintain your code later. Certainly if that developer is familiar with regular expressions and uses RegexBuddy. Regular expressions make most input validation, searching and parsing tasks much easier. 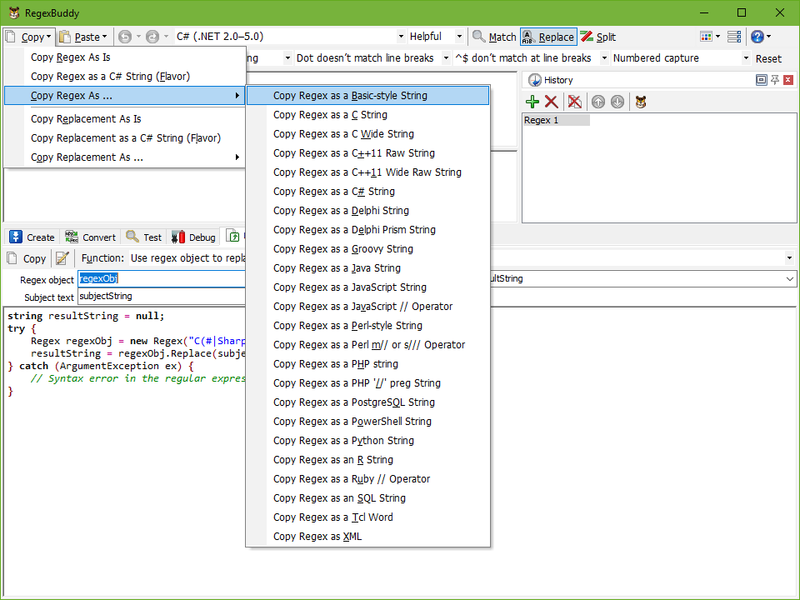 RegexBuddy makes programming with regular expressions much easier. When you are faced with maintaining code using cryptic regexes, just copy and paste the regex pattern into RegexBuddy for study. You will see the pattern laid out as a clearly to understand tree, and quickly grasp the way the regex pattern works. The Explain Token button links each item to the appropriate section in RegexBuddy's detailed regex tutorial. Create or edit regular expressions with RegexBuddy's building blocks instead of or in combination with typing in the pattern using regex syntax. RegexBuddy keeps both automatically in sync. Test and debug your regular expression in RegexBuddy before using it in your source code. Test each regex in RegexBuddy's safe sandbox without risking precious data. Quickly apply the regex to a wide variety of input and sample data, without having to produce that input through your application. If you use another language, or want to update a regex in an existing piece of code, simply copy and paste the regex by itself. RegexBuddy can convert a regular expression into the string styles used by most languages, adding and escaping quotes and other special characters. A tedious and error-prone job to do by hand. Get RegexBuddy now to quickly and confidently develop software using time-saving regular expressions. "I just had to write to tell you how much I love this software. It has reduced my code by hundreds of lines, and simplified my code tremendously. And I'm still finding new things that it can do. Also, I'm becoming the "go to" person for regular expressions. I don't know what I'd do without it now. I'm constantly finding new uses for RegEx in my code."